Outdoor specialist Quechua is all about capturing your sense of adventure with its camping, mountaineering and skiing gear and has now outed a smartphone to guard against the perils of those endeavours. 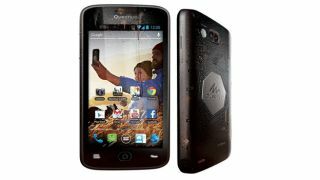 The Quechua Phone, made in association with Archos, pledges to guard against rain, snow, sand, mud, cold, snow and the occasional drop. It's a 5-inch handset, packing Android 4.1, a 1.2GHz quad-core Qualcomm processor and 4GB of internal storage with a MicroSD slot. It's also got a 5-megapixel camera for snapping shots of the great outdoors and its inhabitants. Alongside its IP54 certification, it also packs a whopping 3,500mAh battery unit, which it promises will survive 22 hours of call time. That may appeal to those spending the night in the wilderness. Now, our French isn't what it was at secondary school, but judging by the source article, there'll be no 4G, but it does come at as accessible price for a second smartphone. It'll be 230 Euros when it lands on December 5. That's about £190, $312 and AU$343. No word on international availability just yet, but we'll keep you posted.